Meet the newest member of the Longview Lodge. I insist on calling him Pepe Le Pew; Matt refuses to support or participate in this idea. Boooo. I have reluctantly agreed to call him “le pew”. You win some, you lose some. Le Pew came all the way from Michigan City where he used to live in a quilt shop. Before that, he lived in an antique shop and before that? I can only assume that he was a staple member of a local parish. Just a guess. Le Pew fit perfectly in our entrance- almost like he was made for this home. He would be the perfect piece to greet our guests but needed to get cleaned up and dressed up before we showed him off. Typically, I would tackle a re-finish project myself. This piece was different. For one, it was HUGEEEEE. 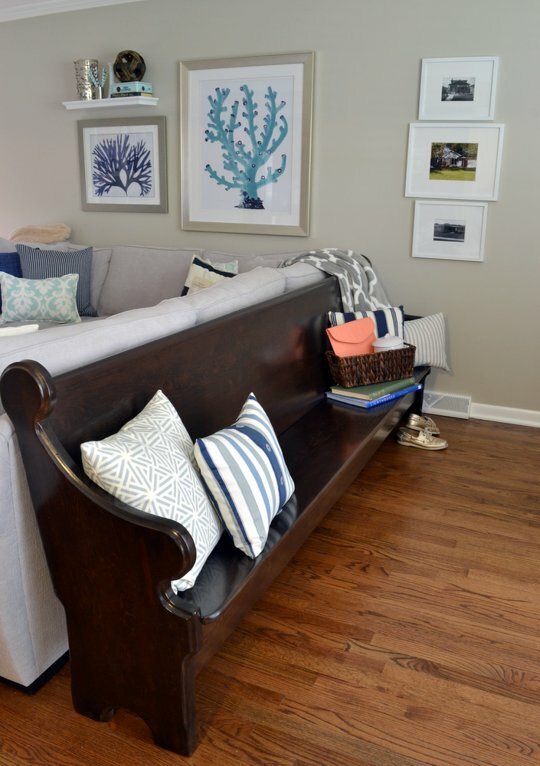 For two, I had a feeling this pew was going to be a staple in our home for years and years and years to come, so I wanted it to look perfect. As much as I like to think my DIY skills are coming along and could tackle a project like this, let’s be honest, my skills are no where near a professional’s. That’s when I decided, if I wanted to A. not be tied down to this enormous project for my entire summer and B. create a piece that would withstand the harsh test of time… a professional was the way to go. The negatives to hiring this project out? A non-DIY price tag. Not that it broke the bank, but let’s be real here… when you choose to hire instead of DIY, the price tag is going to be higher. By no means am I saying that the price tag wasn’t completely worth it, I’m just saying that a higher price tag is definitely a factor whenever deciding whether to DIY or hire. A few weeks later, I picked up Le Pew. I couldn’t believe my eyes. Meet the new and improved (Pepe) Le Pew. Is it just me or can you stare at this masterpiece all.day.long? And like any other fashionable gentleman, some simple accessories are a must. Thank you Dave for thinking of us and literally trucking this gem to the Longview Lodge, where we promise to shower him with loads and loads of love and laughter. 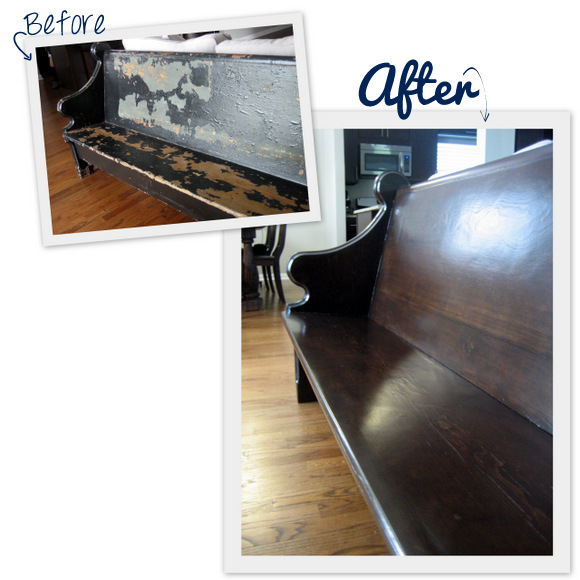 And another thank you to our amazing re-finisher at Bermar Stripping & Refinishing. If you decide to hire instead of DIY & you live in the Chicagoland area, I would highly recommend this company. Amazing. It literally took a team effort to breathe life into this old piece…. … and I couldn’t be more grateful. Next on the DIY to-do list, a vintage umbrella holder. Any ideas?